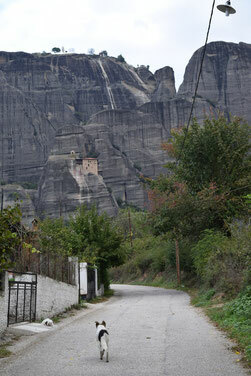 My friend recommended me to go this place,Meteora. It is the world heritage. The churches are standing top of the cliff. It's crazy. who did it?? I also want to recommend to come here.It was really a grand view!! anyway, the dog in this photo was my company. Actually in Greece, there are many wild dogs and cats in the street. because they don't have a place to kill them like Japanese does. But these dogs are calm. When I was walking,this dog followed me to go. oh..so cute.